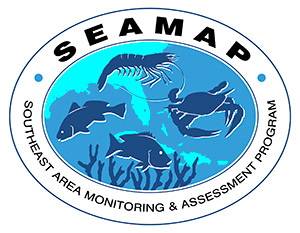 Below is the third preliminary data summary for the 2008 SEAMAP Summer Shrimp/Groundfish Survey in the northern Gulf of Mexico . This week's summary includes sampling from June 16 through June 23 by the NMFS vessel Oregon II, and by Texas vessels. Catch data from the Oregon II were taken with a 40-ft trawl. Catch data from the Texas vessels were taken with 20-ft trawls. Plotted catch rates have been converted to pounds per hour for a 40-ft trawl (20-ft trawl x 2). Shrimp counts are heads-on. The squares on the charts are 10-minute grids. The number in each grid square is the average catch or count from all stations (may be one or more stations) that were sampled within a particular grid. The sampling stations were located randomly by depth zone. The catch data from Texas indicated that the highest catch rate of brown shrimp was 139.1 lb/hr in 15 fm at 26° 59' N. lat. and 97° 11' W. long. The highest catch rate for white shrimp was 182.6 lb/hr in 11 fm at 28° 30' N. lat. and 95° 47' W. long. The highest catch rate of pink shrimp was 75.2 lb/hr in 11 fm at 26° 19' N. lat. and 97° 03' W. long. The maximum total catch rate excluding the three shrimp species was 884 lb/hr in 5 fm at 28° 39' N. lat. and 95° 49' W. long.